Whether it’s watching your favourite movie, taking your work with you on the go, downloading the latest dating app or keeping your kids preoccupied, tablets are something we depend on in so many ways, so make sure you buy the best tablet for your personal requirements. What about the best 10 inch tablets? The best tablet will combine a speedy processor and a high screen quality with a great price. With that in mind (along with a whole bunch of reviews), we’ve placed the iPad Pro 10.5 at top of our list. Of course, Apple isn’t the only company jumping onto the tablet bandwagon. 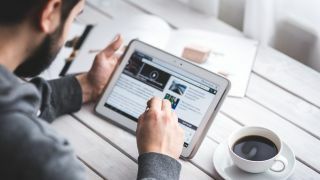 If processing speed and super duper screen resolution aren’t on the top of your list, you may want to consider tablets from the likes of Samsung or even Amazon for a good budget option. When you’re browsing through our list, be mindful of what you want its sole purpose to be. Those looking to run heavy programmes may want to look at the Apple iPad Pro 12.9. Want to take your tablet to work? Look at a tablet/PC combo like the Microsoft Surface Pro. It you want to download your entire library of movies, watch out for storage space. But if you know it’s going to end up in the hands of the kids, a budget option such as the Amazon Fire is always a good idea. As the best priced future proof tablet, the Apple iPad Pro 10.5 features the latest processing technology so it can handle the weightest apps and programs. Its resolution may not be as big as its big brother, the iPad Pro 12.5, but it’s still far superior than any other tablet on our list, making it a great buy for movie lovers, photographers and graphic designers. With heaps of space to store apps, movies and other weighty data, you won’t be on the end of the ‘low storage’ notification any time soon, and with the option to go cellular, you can even use WiFi remotely. With fantastic resolution, a decent processor and the option to extend the memory from a mere 32GB to a handsome 256GB, the Samsung Galaxy Tab S3 has come on leaps and bounds compared to its predecessors. While the processor may not be up for weighty apps, running your favourite film while having a couple of games open in the background won’t slow things down. It’s compatible with the S Pen, great for sketchers, and for movie and music buffs, the quad speakers will certainly clear things up. If you’re looking for a tablet to play around on, ie, play games, watch films and stream music, you don’t need to go for a singing and dancing Pro. With an RRP of £340, the iPad 9.7 is almost half the price of the iPad Pro 10.5, and it’s cheaper than the Samsung Galaxy Tab, even when it boasts the same screen size and resolution. With HD video recording and a decent 8 megapixel camera, it’s an ideal family iPad that won’t break the bank. There’s no denying that the Apple iPad Pro 12.9 is the most technologically advanced iPad yet but that comes with the pretty extortionate RRP of £769. For a tablet, you may argue that price tag is too far but thanks to its A10X processor, large hi-res screen and compatibility with the Smart Keyboard, it can also double up as a laptop. If you’re looking for that kind of style, the iPad Pro plus the Smart Keyboard actually comes out cheaper than buying the Microsoft Surface Pro, so long as you don’t mind the iOS operating system. If you’re looking for a cheap tablet that delivers a good screen size, good processing and good screen quality for an attractive price, this Asus will probably fit the bill. If it’s going to be used for apps and movies, it’s good to know that this tablet is compatible with Qualcomm Quick Charge 3.0 for a quick boost of juice when the battery bar gets low. Those who tend to browse social media before they go to bed may be interested to learn about its blue light filter, as blue light can cause sleepless nights. When you know that you’re going to be handing your tablet over to the kids from time to time, it’s handy to know that this one is made from aerospace grade aluminium for an ultra tough exterior. For series and movie lovers, the Huawei MediaPad offers laterally positioned stereo speakers that you can switch up to high volume no problem, while the display promises vibrant colours and a sharpness so you can experience your favourite show in all its glory. If you’re looking for a tablet for gaming only, experts comment that it’s not quite up to the task with some titles. The smallest of the iPad family, Apple certainly haven’t left it out when it comes to features. While it may possess the oldest processor out of all the iPads, it’s still quicker and more capable than some of the tablets on the list, while its display and screen is something that experts are raving about. With its size being just about small enough to slip into a rather large jacket pocket, it’s good for taking on the go, whether it’s reading an ebook on the train or obsessing over the latest addictive app. The Amazon Fire HD 8 is the impulse buy you can deal with, especially when you need something to entertain the kids when they’re messing around in the back of the car. You can get hold of an Amazon Fire HD 8 for less than £50 at may retailers, which is a small price to pay for a library full of apps, ebooks and streaming homes like Spotify and Netflix. The compromise, according to experts, is in the screen and speaker system, but when you’re only using it occasionally, or handing it over to the kids every five minutes, we don’t think it’s worth worrying about. With a super powerful 7th generation Intel-Core processor and up to a huge 1TB of storage, the Microsoft Surface Pro is for the workers. Whether you’re running a weighty graphics programme or sifting through the world’s most complex spreadsheet, it should be able to handle things smoothly. It’s certainly an alternative to the iPad Pro, although the RRP is it that bit more, and you’ll have to consider the keyboard and pen as an additional cost, too. Avid reader? Take a look at our guide to the best Kindles and e-readers.